Tatu Metsätähti and Tatu Peltonen formed their electro duo Mr Velcro Fastener in the small town of Turku, Finland back in 1995. Returning to Electrix with their third full EP, they have delivered their own unique and recognizable electro sound with two new cuts. 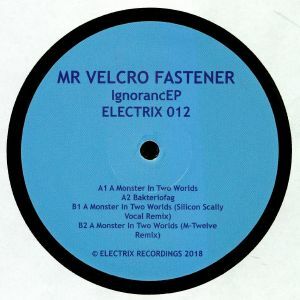 Additionally, there’s remixes from Silicon Scally (Carl Finlow in his electro guise) and M-twelve (aka Billy Nasty And Nick Dunton). 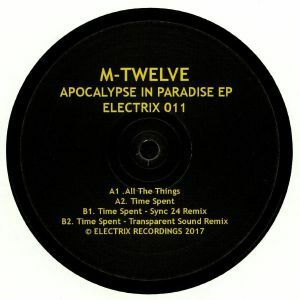 M-Twelve is a new collaboration between Billy Nasty and Nick Dunton. Taking their name, M-Twelve, from the iconic Fred Perry T-shirt, the pair decided to combine forces based on a love of techno and electro, their strong friendship and many late night conversations in the back rooms of various nightclubs. The EP features their two original cuts of beautifully crafted emotional electro, the warm and glittering ‘All The Things’ and ‘Time Spent’ with it’s deep narrative and tough machine groove. In addition, remixes of ‘Time Spent’ come from Sync 24 (Scand / Cultivated Electronics) who delivers an energetically fuelled reworking and Electro veterans, Transparent Sound with a stripped and stomping acidic version. Umek continues his Zeta Reticula series for Billy Nasty’s Electrix with ‘EP 6’. The bass-quaking ‘Reticulum’ opens the EP and the release instantly sparkles and explodes into electrofunk action, followed by ‘Solar Analogs’, like a ticking time bomb. ‘Rotating Protostellar Cloud’ heads up the B-side with its more Moroder / Kraftwerk era sound that’s epic and melodious, before ‘Circumstellar Debris Disk’ completes the quartet, with a flurrying filmatic soundscape approach. Electrix Records launches its 2016 schedule by welcoming back after almost 3 years the always impressive, Carl Finlow. His ‘Electricology 4 EP’ once again shows why he’s a master of the genre. From the tough and funked-up ‘Lateral Thoughts’, speckled and melodic ‘Hyperloop’, squelching, bassy ‘Suspect Reanimation’ and sinister, beat-driven ‘Latext’, right through to the playful ‘Atomic Level’ (a bonus track for the digital release), the EP shines, with a stamp of high quality running though its core. DynArec needs no introduction for most electro heads. Here another solid release by this french producer who remains submerged, but drops a stellar electro release from time to time.